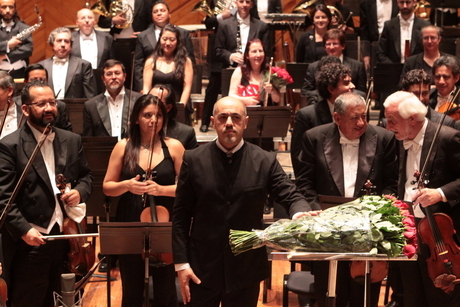 Azerbaijani People`s Artist Yalchin Adigezalov has conducted Orquesta Sinfonica del Estado de Mexico orchestra. The Azerbaijani embassy in Mexico said that the symphonic gravure "Don Quixote" by Gara Garayev, as well as P. Tchaikovsky`s ''Variations on a Rokoko" and S. Rachmaninoff`s "Symphonic Dances" were performed during the concert. Famous Italian cellist Roberto Trainini performed as a soloist. "It was a great honor for us to work with Maestro Yalchin Adigezalov. He showed professionalism and comprehensive knowledge. He is really a great conductor," concertmaster Felix Parra said. Adigezalov is a representative of the third generation of the famous musical dynasty of Azerbaijan. He has directed symphony orchestras at opera and ballet houses in Turkey and Russia, and participated in Salzburg Festival in Austria. In 2003, he was music director and conductor of Alexander Borodin`s Prince Igor staged by Dmitry Bertman, which opened the International Opera Festival in Aspendos, Turkey. Maestro Adigezalov has performed with outstanding soloists, including Mstislav Rostropovich, Nikolay Petrov, Sergey Stadler, Ivan Monigetti, Boris Berezovsky, Dmitry Kogan, and many others. He has released eleven records in the USA, Turkey and Britain. Along with the Azerbaijan State Symphony Orchestra and the Bolshoi Symphony Orchestra, Adigezalov has recorded eight CDs in USA, Russia, Britain and Turkey. The Orquesta Sinfonica del Estado de Mexico (the Symphony Orchestra of the State of Mexico) was founded in 1971 under the patronage of the government of the Mexico state. Among the records of the orchestra are all the symphonies of Beethoven, Schumann, Brahms, Tchaikovsky, Verdi and Rossini's music, as well as works by Spanish and Mexican composers.